This spectacular guilloche and enamel ring makes an imposing statement. Worn by man or woman, this jewel says, "I mean business." It says, "I know who I am and what I'm about." 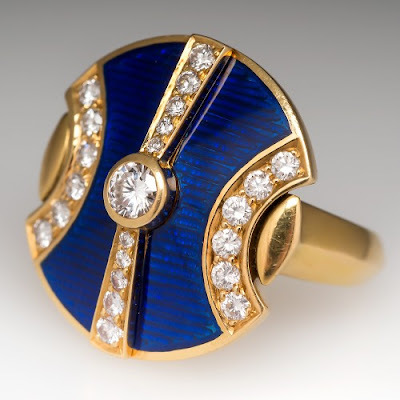 Featuring a powerful combination of classic white round diamonds, 18k yellow gold, and striking blue enamel overlaying intricate guilloche engravings, this striking designer ring was fashioned by the renowned UK designer Leo De Vroomen. De Vroomen is most highly appreciated for his use of enamels in a broad array of bold and beautiful colors. Sometimes subtle, sometimes loud and ostentatious, his color choices always make a clear statement. In many of his pieces, Leo adds more interest with sculpted repousse work. His careful attention to detail and form lends his pieces an artful elegance worthy of attention. His use of diamonds is typically understated. Even in this piece lined with diamonds, their brilliance is balanced with the deep blue enamel background and the prominence of the yellow gold lines surrounding the stones. Indeed, the longer you stare at this particular ring, the more evident it becomes that De Vroomen is a master at achieving balanced, striking designs. That this ring was fashioned in 1986, at the height of big and bold, it is clear that although perhaps emboldened by the such demands in the markets of that decade, De Vroomen brought a subtlety to the table with this ring. This is in keeping with his philosophy that the woman (or man in this case) who wears this ring is the one who truly makes the impression, not the stone or the jewel. In the realm of creative design, it is Leo's uncompromising commitment to freedom that infuses every De Vroomen piece with subtle elegance that transcends time and defies, and yet defines, the trends of the day. Leo describes his work as far more than a career. "It's about being true to yourself and enjoying the freedom of doing what you love," he told the Spectator. While he does not adhere to what he calls "the vagaries of fashion," De Vroomen does adhere to a standard of excellence that some describe as bordering on obsession. "[The] pieces are not just beautiful in terms of proportion, shape and colour combination or quality of finish, they are perfect engineering machines with all kind of cleverly hidden mechanisms that make them truly special to wear," says Alicia Reyes, author of the blog Collecting Fine Jewels. Leo crafts his wondrous jewels at his atelier in London, focusing his energies on creating one-of-a-kind pieces that could be categorized as haute couture, though he would not do so himself. Mr. De Vroomen grew up in Holland, the youngest of eight on a tulip farm. Surrounded by such beautiful colors, but perhaps weary of the daily grind of farming, Leo longed for a world of artistry away from the soil. He followed his heart to Switzerland, where he was qualified as a Master Goldsmith. In 1965, he moved to London, where he met his wife Ginnie, who has served him faithfully as design partner and muse for their established atelier De Vroomen Design. Together, they conceptualize and manufacture every single piece in accordance with their unique vision. In discussing their perfect De Vroomen patron, Leo states on his website, "My jewelry is for grownups...it's not for the fainthearted. It's for women who have confidence and are as careful about their jewelry as their clothes." He goes on to say, "I am deeply passionate about my jewelry. To create something innovative, dynamic and beautiful without compromise is always exciting. But the real pleasure comes from seeing it worn by the right woman with confidence and pleasure." Are you that woman? Does this ring speak to your soul? If you must have it, then please do not hesitate to call on us. We are more than happy to assist you in making this striking, bold, and alluring De Vroomen ring yours.